Hayley Young. 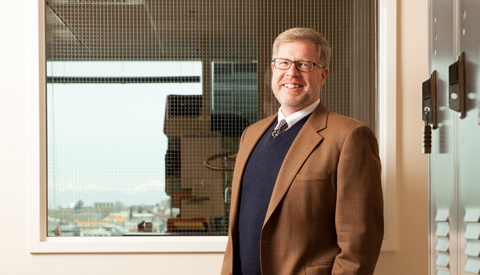 PICTURED: Seattle Cancer Care Alliance Executive Vice President Norm Hubbard. Norm Hubbard’s passion to eliminate cancer in his lifetime is a constant motivator in his stewardship of the Seattle Cancer Care Alliance. As EVP, he is responsible for overall strategic leadership and operational management of SCCA, one of the nation’s top 10 cancer centers. Until a cancer-free day comes, he says, “I want to do everything I can to help more patients get the best care possible in an environment that supports continual improvement in both the care they receive and the ways that we deliver that care.” Hubbard joined SCCA in 1998 as its chief operating officer. He was charged with uniting the research teams and cancer specialists of the Fred Hutchinson Cancer Research Center, Seattle Children’s and UW Medicine. He compares his leadership style to piloting a boat: “Keep your eye on the horizon and make sure you get light below decks.” In other words, he helps navigate the organization through a sporadic and ever-evolving health care environment and makes sure that his crew understands and is committed to the mission. Hubbard led SCCA through its first expansion in 2005 and is now leading a second expansion, with construction set to begin this year and open to patients in 2020. The new space will add 250,000 square feet, more than doubling SCCA’s current space. Cindy Hecker oversees strategic direction, manages overall operations and clinical care, and represents Northwest Hospital & Medical Center as part of the UW Medicine system leadership team. Hecker began her 35-year career with UW Medicine as a registered nurse at the bedside, moving quickly into nursing leadership and then to successive senior administrative positions, including 12 years as chief nursing officer and senior associate administrator for inpatient operations at Harborview; assistant dean for clinical practice, UW School of Nursing; senior associate administrator, clinical operations/integration for UW Medicine; and interim chief health system officer for the entire UW Medicine health system.